Born in 1887 Myra Willard became a pupil teacher at Greta public school in the Hunter Valley north of Sydney in 1904 and in 1908 was awarded a scholarship to Sydney Teachers’ College. Allowed by the Education Department to enrol at the University of Sydney, she studied under George Arnold Wood, the first Challis Professor of History. Willard graduated with First-Class Honours in 1917 and won several prizes, including the Venour V. Nathan Prize for Australian or Imperial History in 1920. In May 1920 the Senate of the University of Sydney awarded Willard the Frazer postgraduate scholarship in history. Wood supervised Willard’s postgraduate study of migration to Australia and described her as ‘an excellent research scholar’. 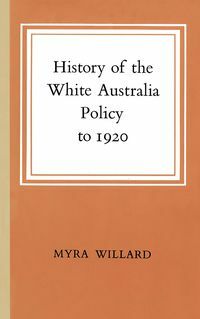 At his instigation she wrote a prize-winning essay, The History of the White-Australia Policy to 1920, which in 1923 became the first book to be published by Melbourne University Press. Willard was awarded the Harbison-Higinbotham Research Scholarship by the University of Melbourne.